The Wilderness Peak project dates back to 1964, when a novice trail named "Partridge Alley" was proposed to the west of the present day Exhibition trail. Though it was never cut, it continued to be proposed into the early 1970s as part of a larger real estate development. In this proposal, the trail would have been served by a new double chairlift to be installed on the western side of today's Exhibition (neither of which were completed). An access road was built to the far west of the mountain for the proposed real estate development. The lower portion of Wilderness Peak was briefly realized in the late 1970s and 1980s with the construction of the Little Beaver area. Usage was minimal by the start of the 1990s, however. In 1994, the first top to bottom trail of the Wilderness Peak area was cut in conjunction with the Outback complex. 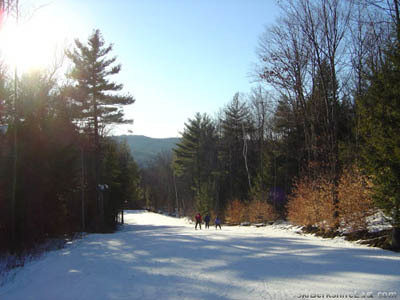 Originally labeled as an access road on trail maps, the Roundabout trail would later be graded for skiing in 2001. 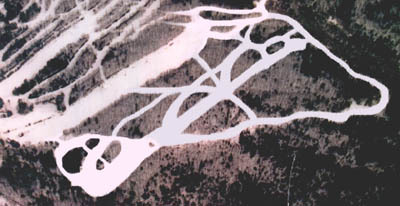 The trail would be vital to the Outback complex, as the Exhibition trail (at the end of the Outback complex) was often overly challenging for novice skiers. The next portion of Wilderness Peak development started in 1999, when initial work was started on the Wilderness Peak trail. Clearing continued partway up the mountain, however the necessary equipment wasn't available to continue on a larger scale. 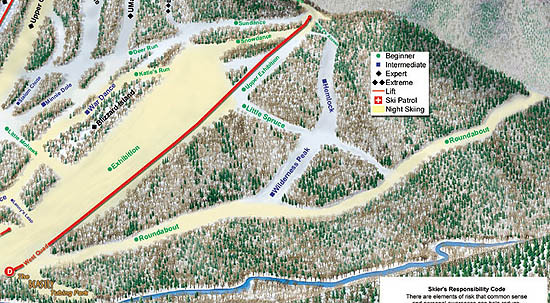 Significant work was commenced over the following off-season, as nearly all of the proposed Wilderness Peak trails were cleared. 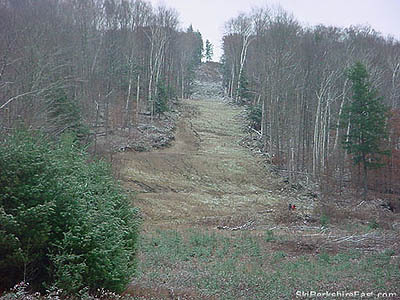 Another year later, five trails were graded and prepared for skiing - however, the 2001-2002 season featured little natural snowfall, resulting in the grand opening of Wilderness Peak being postponed until December 26, 2002. While a chairlift was originally proposed for the Wilderness Peak trail, a Borvig-Leitner fixed grip was acquired from Berthod Pass, Colorado to replace the Exhibition Double chairlift in 2003. Running from the West Lodge to the top of the Sun Dance trail in the Outback complex, the new lift served all of the existing Wilderness Peak terrain. More notably, however, the lift's route resulted in the incomplete top and bottom portions of the complex remaining unserved by lift. 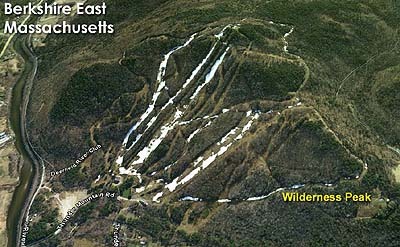 In addition to the new lift install, Roundabout saw its first season of night skiing in 2003-2004, resulting in the first legitimate top to bottom novice night trail from the summit in the history of Berkshire East. 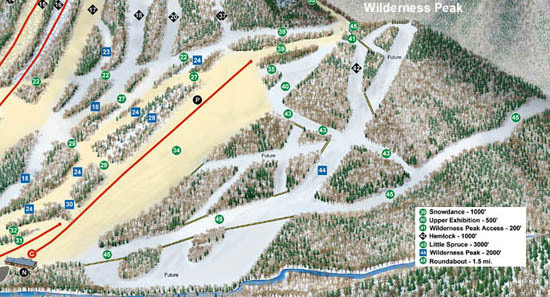 As of 2010, the five original Wilderness Peak trails remain open for skiing. 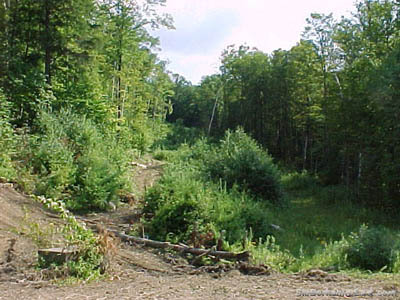 Additional trails cleared in 2000 have since grown in. An additional trail partially graded in 2001 (following the upper portion of the 1970s access road) also remains unopened.